Person L’s second album reveals several things. 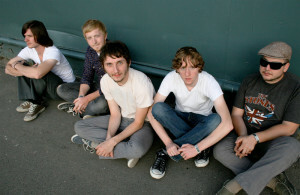 First, the Philadelphia five-piece, formed in 2006 by Kenneth Vasoli, was not a one-hit wonder with their debut, Initial, which Vasoli self-released on his label Human Interest in August of 2008. Second, the band was not a distraction or short-term project for Vasoli after the dissipation of his long-time band The Starting Line. And, finally, this album, entitled The Positives, showcases such an evolution and evidences such skill for both Vasoli and his bandmates that this is clearly only the beginning of a very long musical career. Following the release of Initial, Person L spent months on the road with Anthony Green, Good Old War, Motion City Soundtrack, Steel Train and Ace Enders. They played Bonnaroo in June of 2008, where they received accolades from Fuse and SPIN.com. In February of 2009, the band flew down to Lakeland, FL to a studio belonging to Copeland’s Aaron Marsh. Vasoli, who had wanted to make a record produced by Marsh since The Starting Line toured with Copeland, talked with Marsh at great length about their vision for The Positives. The Positives, which was deeply influenced by classic rock, allows the musicians’ interests and obsessions with artists like Bob Dylan, James Brown, Curtis Mayfield and Sam Cook to shine through their songwriting and playing. Goodness Gracious is a raw, static-laced rocker that sounds straight out of the vaults while The Pleasure Is All Mine is boisterous and bluesy, a dead ringer for a song from a much earlier decade. Even Vasoli’s voice, as he sings and yelps and howls, is barely recognizable from the croon of his former band. Another major sonic difference between Person L and their peers is Person L’ s unconventional use of percussion and rhythm in their songs. Boasting two drummers who employ disparate styles and techniques while contributing new, interesting rhythms to each cohesive track, the band aims to startle and surprise the listeners with new sonic landscapes and innovative musical compositions. The rhythmic aspects of Person L’s songs were, in fact, one of the most important and thought-out elements during the writing and recording process of this record. The disc ultimately reflects a sense of optimism (as evidenced by the title), urging its listener, lyrically and musically, to face life with both confidence and sensibility. The 12 songs on the album explore these simple ideas with complex, layered instrumentation and Vasoli’s thoughtful, genuine lyrics. Stay Calm, a deliberate, slow-paced track that recalls Radiohead, represents, for Vasoli, the struggle between positivity and self-doubt. It opens doors to new fans who may be unfamiliar with Vasoli’s previous work while allowing longtime fans a chance to watch one of their favorite musicians grow and change into a more complicated, talented artist. But in the end, the most important thing this record reveals, is Person L’s passion for the music they make.